In Bangladesh the production, sale, and consumption of alcoholic beverages are regulated by laws and consumption is strictly prohibited by Islam. But, both local and foreign liqueur are available in the local bars, particularly in Dhaka and Chittagong. The intake of these beverages appears not to be well controlled, as many different homemade alcoholic beverages were seized in different parts of Bangladesh by the department of narcotics control of Bangladesh. There are some death reports from alcohol use, raising the possibility that alcohol abuse might be quite common in Bangladesh. A few local names of some homemade alcoholic beverages are known such as Cholai, Bangla mad, Dochuani and Tari. Local alcoholic beverages are made usually by fermentation of boiled rice, sugar-cane, juice of date tree, molasses, and fruit juice (pineapple and jackfruits) etc. To our knowledge, the names of all locally made alcoholic beverages and their alcohol content have not yet been documented in Bangladesh. As there is no supervision on production, consumption, selling and use of containers, a possibility of contamination may be a health issue. This legal company (Keru & Co) produces seven different brands of alcoholic beverages and according to them, all contain the strength (42.8%) of ethanol. Dochuani is mostly produced in hilly area of the country and used mostly by the tribes, on the other hand Tari, produced and available in the most of the rural area of plain land of Bangladesh. People in different age groups including youth are the consumer of these alcoholic beverages. People who produce, sell as well as drink these alcoholic beverages especially the homemade products try to hide this in the family as well as in the community. The beverages Bangla mod and Tari are well known in different age groups of Bangladeshi people but other names are mostly and/or only known by subjects who sell and drink them. Chubichi and Dochuani are well known in tribal subjects as they are taken in family festivities (permitted by law). The general people consider spirit as an agent used in medical practice and used as drink by crazy drinkers. As the use and marketing of these agents are underground, the seller and the drinkers apply different code names for the same or related alcoholic beverages in different parts of Bangladesh to avoid law related hassles and social defaming. As nobody checks the quality, alcohol content in the beverages, sellers may take the opportunity to dilute the original beverage for big profit and as such may label them with a different name. Names of beverages and history of consumption only get widely known in case of disasters like death or mass sickness after consumption and seized by police or narcotic department. YPSA is aiming to ensure an alcohol free society by reducing uses of alcohol among the youth community. 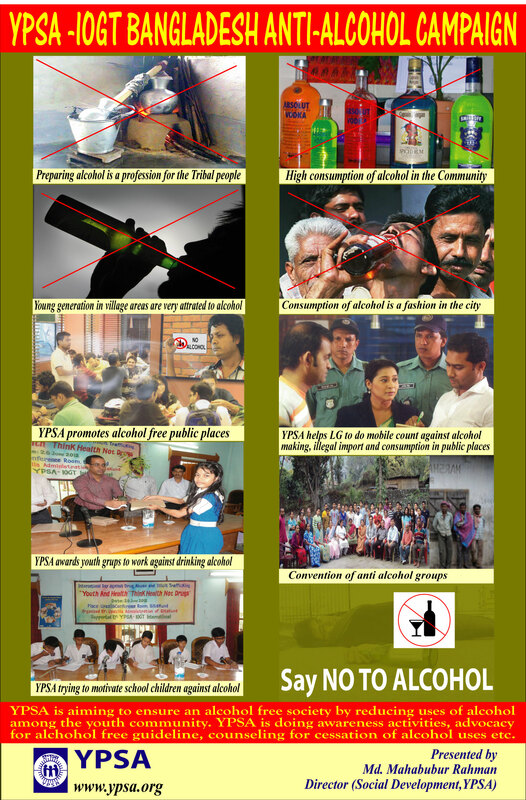 YPSA is doing awareness activities, advocacy for alcohol free guideline, counseling for cessation of alcohol uses etc. To present and share ideas and strategies to help youth to make intelligent decisions about alcohol and drug use. To advocate for better regulations on local and state level as well as for a national alcohol policy. Advocacy with the local government for formulating alcohol free guidelines. As far as we know, none of the organizations have tried to produce alcohol free guideline. YPSA became a member organization of IOGT International. It is the largest worldwide community of non-governmental organizations promotes a lifestyle free of alcohol and other drugs. Its work expands from community action for children and youth to creating, facilitating and developing efficient alcohol policies. IOGT International has joined forces with other advocacy groups and international organizations to promote control mechanisms for alcohol use. It encourages public policies that seek to minimize alcohol problems by decreasing overall alcohol consumption. Alcohol is now the leading risk factor to public health in developing countries with low mortality rates and it ranks third in developed countries. IOGT International has been the initiator and co-founder of several networks working on alcohol control. Among them the most significant are Eurocare and the Global Alcohol Policy Alliance (GAPA). It also works closely with international organizations, UN agencies and Non-Governmental Organizations.